For two years, I served on the Ann Arbor Book Festival's planning committee as Volunteer Coordinator. I stepped down last fall to focus more time on my family and my business, but am happy to announce that Lucy White is doing a great job as this year's Volunteer Coordinator. If you will be in Ann Arbor, Michigan from Thursday, May 15th to Saturday, May 17th be sure to check out the festival and maybe even volunteer. 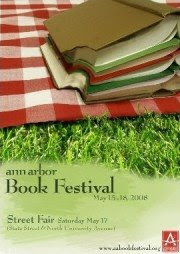 If you would like to volunteer send an email to: aabf@aabookfestival.org or call 734-369-3366.